The Cuban Knight Anole originates from Cuba, but has now spread to the USA.. 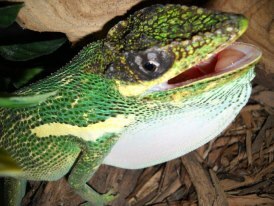 It is the largest of all anoles and is known for having a very strong bite. They have a lifespan of 6 to 10 years, and can grow to between 12 and 20 inches. 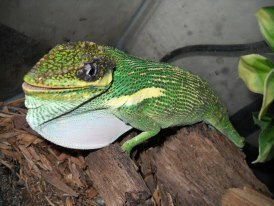 Males have a dewlap which is a flap of skin under their chin that they expand to make it look like they are puffing up their throat. Females can have them too,,but they are never as big as a males. Cuban Knight Anoles need plenty of room, so you will need a minimum of a 4 ft. high, 2 ft. wide and 2 ft.
deep enclosure. You will need to supply plenty of items for your Knight Anole to climb on. Knight Anoles will sometimes digest the ground material while hunting their insects, so you will need to use a completely digestable substrate. Some appropriate bedding optons are: paper towels, newspaper, reptile carpet, non adhesive shelf liner or tile. Never use sand or any other loose substrate as they can cause impaction. Never house two Knight Anoles together. They are extremely territorial and hostile. Putting more than one in an enclosure will cause undue stress which can lead to health complications and fighting which can lead to injury or death. Butterworms, mealworms, crickets and waxworms all are good choices to feed your Knight Anole. Make sure to dust you feeder insects with a calcium/multivitamin supplement. They have been known to eat fruit as well, so you could leave some baby food fruit on a dish for them. Cuban Knight Anoles need plenty of humidity. You should mist them at least 3 times a day. Ideal humidity is between 70% - 80%. Your anole will drink the droplets off of leaves and decorations after misting. You also need to provide a large but shallow water dish. Make sure to change the water daily. The Cuban Knight Anole lives in warm temperatures year round so you need to keep their temps around 83 - 90 degrees, with a basking temperature of 85 - 90 degrees. You can reduce the temps down to 75 - 80 during the night, but don't let them get below 75. Cuban anoles also need proper UVB lighting. The UVB light needs to be on for 10 - 12 hours a day. They need a minimum of a 5.0 UVB light. These lizards are arboreal and spend most of their time up to 15ft. high in the trees. Their normal color is green with yellow patches. When they are dark green to brown they are stressed or unhappy. You should leave them alone and check their temperature and humidity levels. If they are in a territorial or aggressive mood they turn a reddish green, if so, you should stay away from them. These anoles are aggressive by nature and they do not tolerate being handled and can leave a nasty bite. They are not good pets for children of any ages and they are not for playing with. They are very amazing and fascinating reptiles, but they are for watching, not handling.